A painting trip to Malta, Valletta the capital. I had never been to Malta before though it was always on my list for visits. I say this, as in a strange way, this diminutive island in the middle of the Mediterranean Sea, had a more than significant influence in my upbringing. Firstly, my dad was in the Royal Navy in the sixties and seventies and we lived in married quarters in Portsmouth on the south coast. Back then, the navy had a huge presence in Malta. Other neighbours were stationed there too, and would arrive back to litter their houses with souvenirs festooned with the cross of St John and tales of marvellous weather and clear blue waters. So my dad and all our neighbours knew Malta very well, and it was often raised in passing as an impressive place to visit. Added to that, a fair number of Maltese came to live in the city. Presumably they too had links with the Royal Navy. So it ended up that their children went to the same Catholic school as me. Looking back, I think about a third of the pupils were of Maltese decent. The names, Debono, Muscat, and Buttigieg were as common in my childhood as British names such as Smith and Jones. This was my life right up until I was 18 when I left school to go to Art College, so when the opportunity came up to go to Malta recently, I was very keen. This was a holiday trip with my wife really, not a full on painting trip so I only took a 30cm x 23cm watercolour pad. This is pretty small for me but I had to be quick or I would be in big trouble if I spent day after day working. I put on Facebook that I was just off to Malta for a week and I did wonder if any old friends from way back would somehow pick it up and contact me. About an hour or so after the post went up, Mark Debono contacted me through his wife and was living only 10 minutes away from our apartment in Marsascala. We all went out for the evening and talked about old times. He and his wife were good enough to take us around the place the next day too. A tour from a local person is always the best. It was fascinating. Like many of the Mediterranean countries, the possession of this island has chopped and changed ownership numerous times. The Romans, The Normans, The Nights of St John, French, to name but a few have all laid claim to it at one point or another, The last occupiers, being the British, who ruled the island from 1800 and stayed until 1964. The Royal Navy left finally in 1979. It is only in recent years, that Malta is run by the Maltese themselves. Most of the city was built by Grand Master Jean de Valette of The Knights of St John. And it was from him that the city got its name. Building began in the 1560’s and it has a predominantly Baroque feel to it. That said, it has a formidable wall all around it and represented a very serious obstacle to any would be invader. And of course there were many. The last serious attempt was in 1942 when the Germans put Malta under siege to drive out the British influence in the Mediterranean and North Africa. Valletta was brutally bombed, though the siege was not successful, and supplies to troops continued to the allies in North Africa until the Germans finally left Africa to try their luck in Russia. And we all know how that went. I painted this view of Valletta from Slemia on the other side of the bay. It was a real challenge for a painting as it is a stunning sweep of honey yellow stone architecture punctuated with domes and spires. Add the thick vista of the Prussian blue sea, it makes the whole view magnificent. My watercolour pad of 30cm wide was an added challenge though I did enjoy picking my way along the intricate details and working them in with each other. It took a fair few hours, though it was well worth doing, this must be one of the finest city views in the whole Mediterranean. No wonder the entire city of Valletta has been a UNESCO World Heritage Site since 1980. 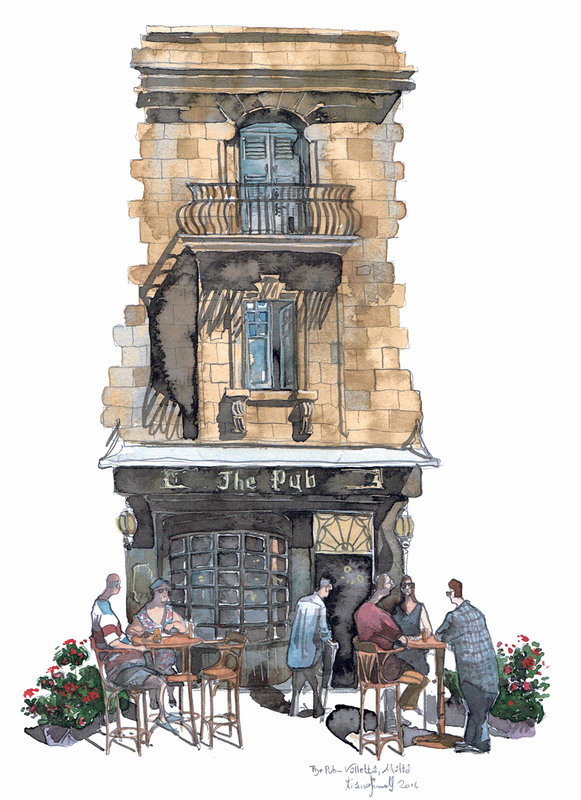 No self-respecting Brit who likes the odd pint could visit Malta without dropping into the last watering hole of the late Oliver Reed. On May 2 1999, Oliver Reed visited The Pub while on a break in the filming of Ridley Scott’s epic Gladiator. Ollie being Ollie had a fair few, when in rolled a group of British sailors from HMS Cumberland. More drinks ensued and he was challenging them all to a bit of arm wrestling. It is not recorded on whether he won or not, though a short while later, he collapsed and died on one of the Pubs bench seats. So ended a legend, dying how he had lived. On one long party. After working on my drawing and painting, I popped inside for a Guinness to pay my respects. I considered the challenge of drinking his last round, though as it was eight beers, twelve double rums and half a bottle of whisky I thought better of it. It is a tiny interior, no bigger than a modest living room. There are of course a few photos of Reed on the walls. Also adorning the walls are named cap tallies, Royal Navy badges and other memorabilia from HMS ships. This was just the sort a British Royal Navy pub I recall from my childhood in the seventies in Portsmouth. They are all gone now, just like dear old Oliver Reed. 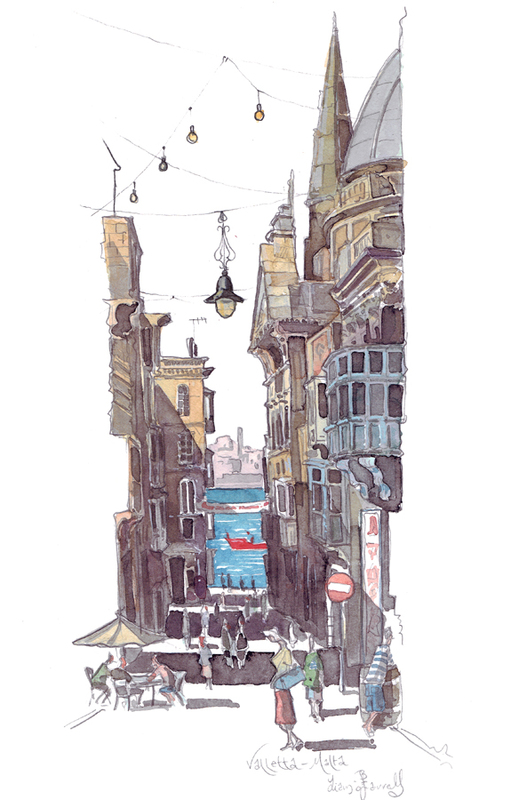 My initial idea for painting a street scene in Malta was to paint Strait Street. All through my early years sailors would come back from Malta saying Strait Street was the best place to go and this had always stuck in my mind as worth a look. It was only later that I discovered that Strait Street (or The Gut) was a place of debauchery, drinking, gambling, painted women, and on street brawling. I should have known, they were sailors after all. All said and done, I was still going to pop over and take a look. My first surprise what that it wasn’t really a street at all. It was more of a wide alleyway that stretched long and thin down to the harbour. The second surprise was that it was near deserted with almost no bars. I guess nothing really survived the British Navy’s exit in 1979. It all looked rather sad. I could see the ghosts of flaking signs of long gone cabaret bars such as ‘The Piccadilly’, ‘Carmen’ and ‘The Old Vic’. It felt rather odd that my dad certainly spent many an evening here. I was walking in his footsteps for sure. A local told me that there are moves to revitalise Strait Street for tourists. Of course it won’t be the same. A reproduction of a ‘wild night’ can never really be one. Not really. Undaunted, I decided to paint Old Theatre Street which shows the dome of the Carmelite Church and the spire of the Anglican Cathedral a bit further down. You can see part two of this blog here. If you are Interested in buying a painting or considering a commission of art or illustration then just mail me or give me a call. 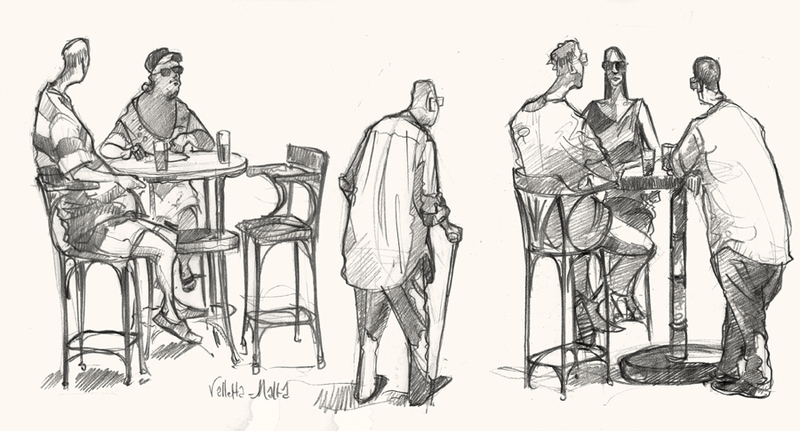 Never been to Malta, but love the clear line drawings. It is a lovely place to visit. Do go if you can. Just got back from Valletta myself. I brought 5 pieces of watercolour papers..ended up buying a dozen more from an arts supplies shop. I couldn’t stop painting. Yes, I’m not surprised. I had a great time there and did at least one work per day. I am big architecture fan so I could have gone on all year. Thanks for your comment again.